Builders Sale presents Fire Rated Doors for premium access under stringent requirements. These classic doors from Access Panels collection come with a broad array of varieties and meet numerous wants and needs of the commercial architectural industry. 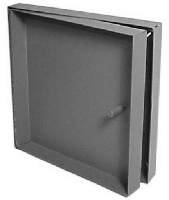 These doors are suitable for fitting on tiles and drywalls. In addition, installing them with due consideration of specialty requirements is also easy with the smart designing and precision engineering. We understand your demanding world and never-ending requirements and provide these doors with and without insulation. With Builders Sale, you buy what you need and not what we sell. In fact, we always endeavor to provide customer-centric solutions and our featured collection of Access Panels indeed is a proof of it. These doors are compliant with UL and ULC norms for fire rating and thus every door from this class ascertains to provide peace of mind when you need it the most. Well, at Builders Sale, we deliver a superb blend of quality, performance, longevity, and styling assuring you to provide a precise fit every time you count on us. Fire rated doors we offer here under one roof are a premium gateway to access through walls and ceilings just the way you deserve. 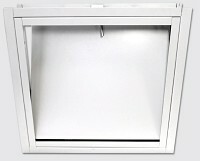 Elmdor CFR12x12 Ceiling Fire Resistant Access Doors CFR Series 12" x 12"
Elmdor CFR18x18 Ceiling Fire Resistant Access Doors CFR Series 18" x 18"
Elmdor CFR22x30 Ceiling Fire Resistant Access Doors CFR Series 22" x 30"